We understand that leaving your pet for a medical or surgical procedure can be a worrying time for you and we endeavour to do our very best to put your mind at ease during your pet's stay with us. On the day of the procedure an appointment will be made for you between 8.30am and 9am with one of the nursing team. They will explain the procedure go through the consent form and fee estimate with you and answer any questions you may have. If your pet is over 7 years old we would recommend the pre-anaesthetic blood test is carried out. You will offered this option during the admission appointment. We will also ensure that we can contact you throughout your pet's stay. Your pet will be weighed and taken to the hospital area. 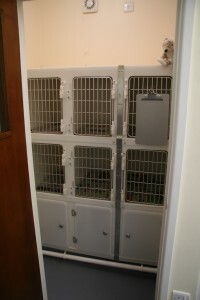 They will be settled in a kennel suitable for their needs and under constant care from our veterinary staff. At Kidderminster surgery we have a seperate cat dog and rabbit ward to enable your pet to have as stress free an experience as possible. Once your pet's procedure is completed a member of the nursing team will telephone you with an update and give you a suitable time for collection. At all times during your pet's recovery there will be a member of the nursing team constantly monitoring their recovery. On collection you will again have an appointment with one of the veterinary nurses or veterinary surgeons to discuss the procedure and to give you all the necessary details on aftercare and follow up appointments. We will arrange to call you the following day to make sure your pet is making a speedy recovery. Should your pet need hospitalistaion due to illness or after major surgery our own vets and nurses will care for your pet at the surgery overnight. We do not "close" at night and unlike some local veterinary practices we will never ask you to transport a sick or injured pet back and forth to another practice to be cared for overnight. We hope you will be able to relax a little more knowing that your pet is receiving the level of care and attention that we would give our own animals in the same situation.